I've noticed, that tracks are not getting switched automatically in 799. I mean, track ends and then nothing. If I have the app open and active I can see notification "Failed to play". Strangely, this seems to be easily reproduce-able for me when using BT headset, but sometimes not reproducible with speaker or when Wi-Fi is enabled. Clearing app's cache helps for like a 10 tracks, then issue returns. I noticed, that when the issue occurs, time elapsed shows 1 second more, than the actual length of the track. Like 4:03 of 4:02. Thanks for the report. Your device/android version/ROM (if any)? Often happen to me too. Same with me here, wasn't present with the update before the last one, all in all it's been a few weeks already at the very least, if not a full month. And, too, happening much more often when using headset (hi-res), and much less frequently when the speaker is used. The song ends, then it's like 3-5 seconds of silence, then "Failed to play" message if i'm keeping the player open and everything stops. Tried ticking on-off settings boxes, like "keep service" and "use wakelock" - nothing worked. The bug itself is sporadic in nature, can't recreate it at will, really. Guys, who notice this, as well, please, check if your elapsed time on the track is 1 second more than actual track length. "Failed to play" here too. Xiaomi Pocophone F1, Android 8.1, MIUI 10 EU. Edit: issue is on build 799, build 795 is working fine. "Faild to play" error too. Same problem - often does not advance to next track, eventually says "Failed to play"
Samsung Galaxy S5, Android 6.0.1. Experienced this problem in builds 799, 800, and 801, but NOT in 797. Just reverted to 797 to confirm. As I mentioned, I reverted to 797 to confirm that the problem was not in that build. Having reinstalled 801... I can no longer reproduce the problem. Having said that, I'll at least detail how the bug panned out for me. The problem initially appeared immediately upon going from build 797 to 799. The very first track I played did not advance, and I could repeat the problem almost every time by seeking to just before the end of the track and waiting for it to (attempt to) advance. The issue continued for me through the updates to 800 and 801 without change. Although again I can no longer repeat the issue after the reinstall, I've included my settings since I do change quite a few things. If I can provide anything else for you, let me know. Should be OK on build 800/801. Not sure why @RubberBob is still seeing it, could you provide some more info? And does anyone else still have this issue in builds 800+. Build 800 played for 14 hours non stop (included the reported devices). 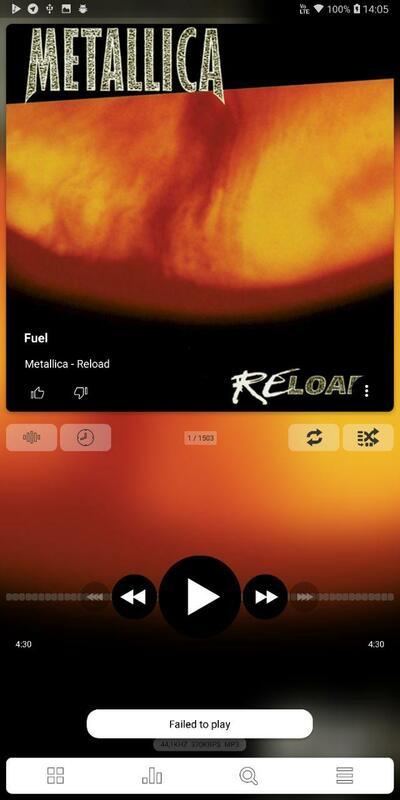 Does this fail for your on default settings (just PA installed NOTHING changed) or do you setup Poweramp somehow? If so, please specify or you can PM me your exported settings. I've been getting the same problem last night on 801 too. Details: Track plays, seems to remain in 'playing' status for slightly longer than the end-time of the track, and the counter goes up to one second over the total length of the track. About five seconds later I see a toast message saying "Failed to Play" and PA stops playback and the counter and seekbar return to zero at the start of the current track. Pressing Play again restarts the current track. using Next Track moves on the the following track fine, so there would appear to be nothing wrong with the actual files. I'll do some tests and see if it was related to the Sleep Timer being active, as I don't recall it happening during the day (could be wrong there though). I've been trying to track down what circumstances cause this as I see it randomly too, but other than anecdotally that I notice it more at night (listening on wired headphones, with Sleep Timer ticked to play last song to end) I can't reliably reproduce it. I have not been able to reproduce it without wireless headphones so far. Using Hi-Res setting increases the chances for me, but disabling it does not mean it won't happen at all. @maxmp When this next happens, can I get you any log data which might help track it down? This is caused by optimization introduced somewhere near 797, which, while may be useful in some cases, causes issue like this for some users. I can't reproduce it on my devices, I guess, due to most test devices being in "virgin" state (no apps, no Android or storage slowdowns, no tweaks). Can you please install this build and comment here if it helps?